PTraffic ProPlus is an easy to use application to enter, maintain and evaluate timetable data and to build route maps. The data format used to create platform independent browser applications is „Portable Data Format“. PTraffic ProPlus includes functions to maintain stations, lines and timetables. The table editor has comfortable functionality for a fast input of time schedules. The included route map editor allows to build easy and quick route maps. The software supports a maximum resolution of 4961 x 7016 pixels for route maps. The maps can be reduced or be enlarged for improve image quality and output perfect images for print or web. Integrated browser applications contain information about stations, lines, schedules and station-schedules. A traffic simulation and a graphic schedule are also included. In addition to PTraffic ProPlus there is a display program „PTraffic Show“ available. Using this your own projects can be made available to greater audiences. 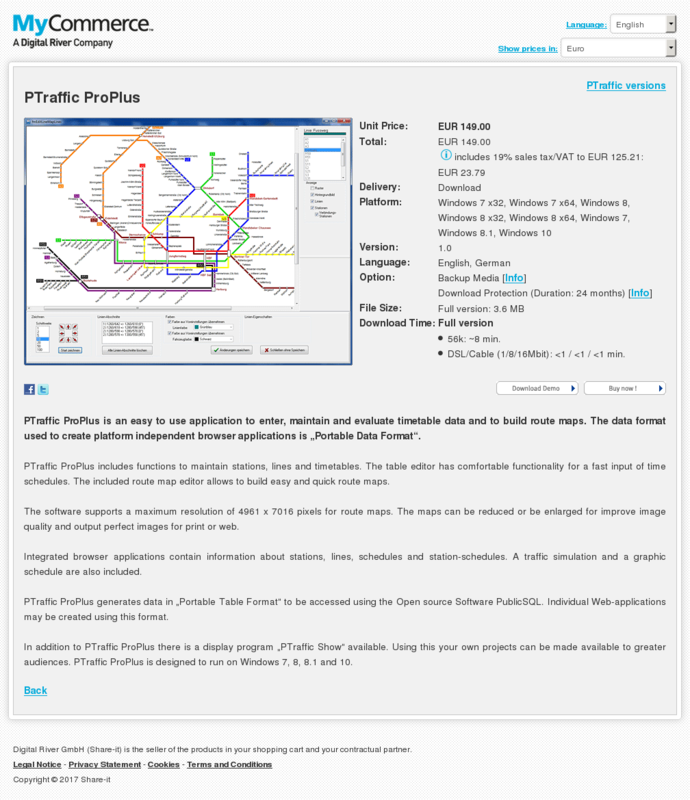 PTraffic ProPlus is designed to run on Windows 7, 8, 8.1 and 10.